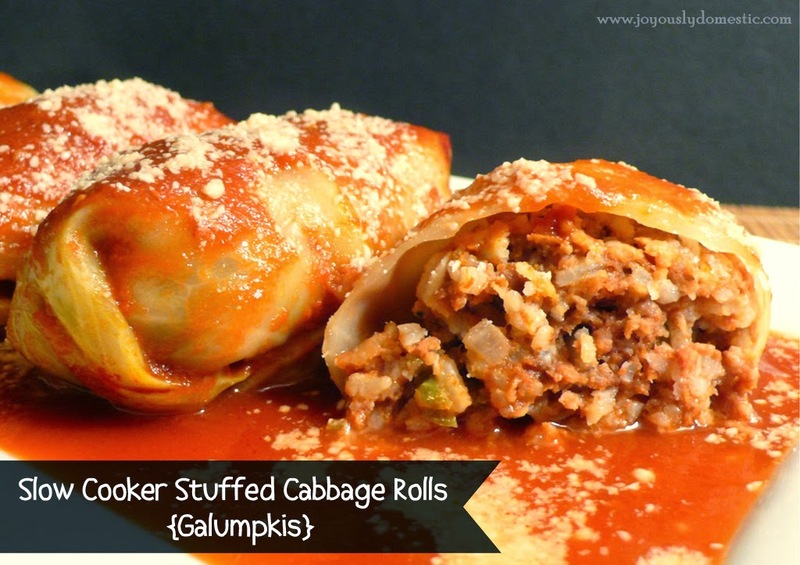 I grew up eating cabbage rolls (my step-father's side of the family was Polish), but never liked the cabbage part. The filling rocked, but I hated cooked cabbage. Cooking the cabbage rolls in the slow cooker keeps them super moist and really allows time for all of the flavors to meld together. I use the same filling for my stuffed green peppers and those can be done in the slow cooker, too. You do need to allow a little time to assemble the cabbage rolls, but I often assemble the cabbage rolls the night before, store them in the fridge in an airtight container (without the V8 juice addition) and then start them in the slow cooker in the morning. Yields 12 - 16 cabbage rolls. Cut the core end out of the cabbage so that the leaves can be removed easily once they cook. Submerge the whole head into a large pot of salted, boiling water. Remove the leaves using tongs as they separate from the head during the boiling process. You're just looking for the leaves you'll be stuffing to be pliable. Transfer leaves as you remove them into a large colander to drain. Do this until you've retrieved 12 - 16 of the leaves and only a small part of cabbage remains. Be careful during this process. Obviously, the water will be very hot. Remove the small part of the cabbage head that remains - it's okay if it's not cooked tender. Allow it to cool for a few minutes, then use those small leaves that you won't be stuffing to line the bottom of your slow cooker. This will create a protective barrier on the bottom of the insert so that the stuffed cabbage rolls do not scorch or burn. Begin assembling the filling by combining the crackers, green pepper, onion, garlic, salt, pepper, Parmesan, beaten egg, tomato sauce (not the V8 juice) and rice into a large mixing bowl. Add in the ground beef and gently work together the ingredients. Lay out one cabbage leaf at the time onto a clean work surface. Cut out the thick vein at the bottom of each leaf - making a v-shaped cut. Place about 1/4 cup of filling onto each leaf. (You may use slightly more or less depending on the size of each leaf.) Fold the cut end of the leaf over the filling, fold in the sides and roll to enclose the meat mixture. (Basically, you are rolling them up like you would burritos.) Depending on how much filling you put into each leaf and how big your leaves are, you should end up with 12 - 16 rolls. Place the cabbage rolls into the slow cooker (seam side down). You will end up with two layers of cabbage rolls on top of the loose leaves. Pour the V8 juice over the rolls. It will look like a lot of juice, but this is needed to keep everything moist. Cover and cook on low for 7 - 8 hours. If you are home during the cooking, baste any cabbage rolls on the top layer that may not be submerged in the V8 juice a couple of times during cooking. Spoon some of the tomato cooking juices over the rolls at the time of service. Serve with additional Parmesan cheese, if desired. Even though there is rice in the stuffing mixture, we love these over mashed potatoes. 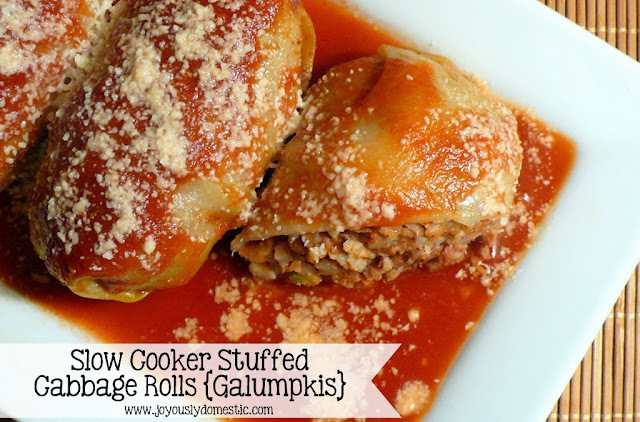 I love this post because my husband's family is Polish, and he loves cabbage rolls, too. And, I don't like the cabbage part. haha. I've gotten a little better with it over the years, but still - the filling is the best part. Lori, see ... great minds think alike. I will pick at the cooked cabbage a bit, but the filling is where it's at! :) I will have to go check out Ina's recipe. And, thank you for the anniversary wishes! Hi, Linda. I am so intrigued by the freezer method you wrote about. I know someone who makes "Freezer Coleslaw," so I guess it doesn't seem that strange now that I think about it. Would you boil the whole cabbage in in the water or just put the whole cabbage in freezer overnight, then take out & let get to room temperature? I believe the reader is meaning no need to boil - just place head of cabbage in freezer overnight, then thaw and assemble the cabbage rolls. Why does the cabbage head (as suggested) go into the freezer overnight, then take out and set on counter until defrosted? Do you then cook the cabbage head after defrosting, or just cut cabbage roll (center) and peel the leaves off from that state instead of cooking first to peel the leave? First time I will be making these and hope and pray that they come out like my mother-in-laws. The reader is providing an alternative to boiling. By freezing and thawing, the leaves of the cabbage break down and become pliable ... easy to stuff and roll with no need to boil. Hope that helps, Cara. I updated the recipe. :) Thank you for pointing that out. And, no ... since it is quick-cooking rice, it goes in uncooked.